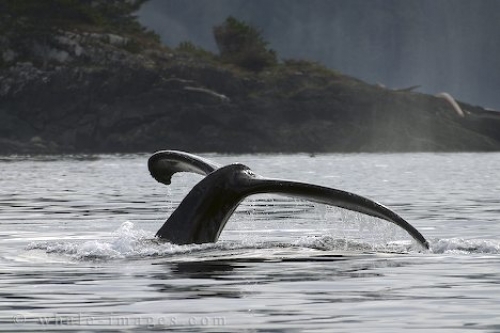 Humpback Whale Tail in the Inside Passage. As this whale dived into the deep it appeared that he had a black tail, since it was silhouetted against the light and reflective background of the water. To the contrary, a humpback whale does not have a completely black tail, but instead it is a mottled grey color on the upper side with white blotchy patches on the underside.